katoite: 1.5 < x < 3. Hydrogrossular is a garnet variety in which a Si4+ is missing from a tetrahedral site. Charge balance is maintained by bonding a H+ to each of the four oxygens surrounding the vacant site. Hydrogrossular is found in massive crystal habit, sometimes grown in with idocrase. Hydrogrossular is translucent to opaque, and found in green to bluish green, pink, white, and gray. The cause of the green color is chromium, and possibly iron. Pink hydrogrossular is caused by the presence of manganese. Hydrogrossular may have dark gray to black small inclusions. It has similarities to jade, and has the misnomers Transvaal jade, and African jade. 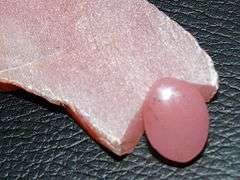 Hydrogrossular is sometimes used as a gemstone, being cabochon cut, or made into beads. Sources for green and pink hydrogrossular are South Africa, Canada, and the United States. White hydrogrossular is sourced from Burma and China.